1. Default to smooth integration. 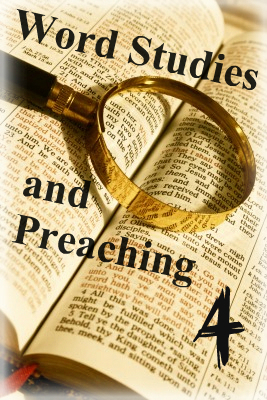 The majority of word study work that you do in your study need not show in your preaching. By show, I mean overt reference to it. The default should be that the study you’ve done is hidden, but the explanation you give is accurate. Sometimes I would even go for smooth integration when I think the translation isn’t the best. So I will read it as is, and then subtly state a preferred translation. No fuss, no critique, just staying on track for effective explanation. I think this is a good default. 2. Underline word studies sparingly and strategically. There are advantages to sometimes letting some of the word study show overtly. Perhaps you go to a couple of familiar or enlightening uses of the term, to give a taste of the process and help people see why you explain it as you do. If this is done too much it will lose its impact. Choose to show the word study more overtly in strategic moments – perhaps when the term is critical to the passage as a whole, or at least to a major point in the passage. Tomorrow I’ll finish the list with three more suggestions on using the fruit of Word Studies. I might mention one other problem that comes under #3: Be careful flaunting your knowledge of original languages as there may be someone (or several people) listening who know more than you do! I am, I would say, middling at Greek (I do prefer to read the NT in Greek, and can manage it fairly well), and was listening to someone preach a while ago who interjected the idea that “to worship”, “proskuneo”, meant to approach and kiss, but in a way that made it sound like a kiss between equals. Unfortunately that is not true, it comes from “to approach” (=”pros”) “like a dog” (=”kuneo”), the idea being more one of subservience. The kissing idea comes from the image of a dog licking its master’s hand. Not only was the idea somewhat off, it also was a complete throw-away with respect to the sermon.